Non-surgical rhinoplasty (or nose reshaping) is an advanced Botox and dermal filler technique for remodelling and reshaping the nasal framework. Non-surgical Rhinoplasty can be performed to improve the height of nose bridges, reduce the appearance of bumps, and rebuild the nose following recreational drug use. 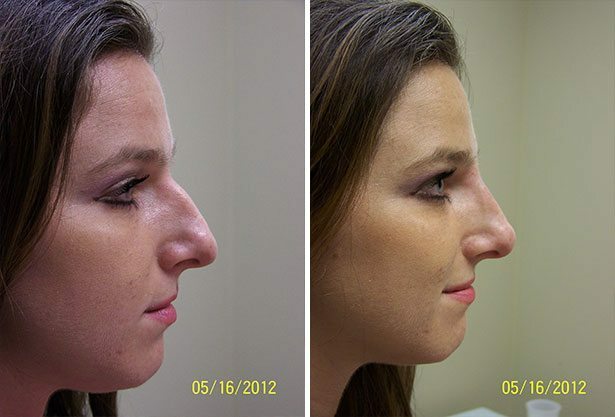 In certain clients it may produce superior results than surgical rhinoplasty. It can also be used in addition to surgical rhinoplasty to further enhance its effects. For many clients, non-surgical rhinoplasty can be preferable to surgical treatment for a number of reasons. It is cost effective, less invasive and has a considerably shorter down time compared to surgical rhinoplasty. At Bedford Skin Clinic, we use a range of dermal fillers for non-surgical rhinoplasty such as Restylane Lyft, Juvederm products and Radiesse. The dermal fillers are injected using a cannula (blunt needle) to minimise discomfort, bruising and swelling. Clients typically report a high level of satisfaction with treatment results usually lasting for over one year. Possible side effects include bruising, swelling and lumpiness but with the use of a cannula these side effects are considerably reduced.